How to overcome the rocky path of bad credit when you need a loan? Your credit score is vital for your healthy financial future. It will determine your eligibility for loans and mortgage. Sadly, the credit score is still mysterious and unknown to many. Some even discover they have a bad credit. It is important to understand all its ramifications if you ever want to improve it or to apply for loans. It is important to be aware of your credit score. In Canada, a bad credit is under 560. Which correspond to a poor credit score. Banks use this kind of score range to determine if they will borrow money. 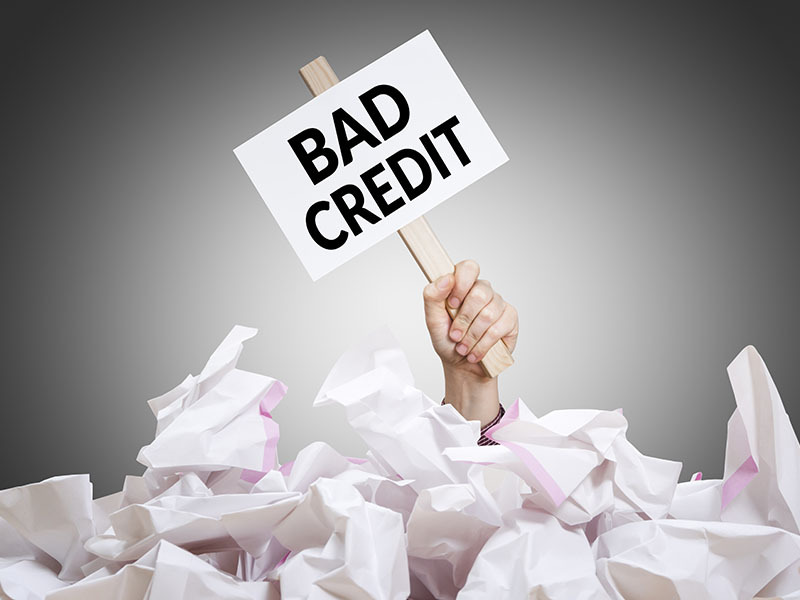 A low credit score will make you too risky in their eyes and it could be difficult for you to find credits. These following key elements can make your score drop fast. A common cause is the late payments. Your credit history counts for 35% of your credit score. If you do not pay on time, your credit scores will suffer. Also, if you do not pay your bills, it is certain that you will have a low credit score. Be sure to always pay on time! If you have any defaults on loans, your credit score will be affected. One missed payments on a secured loan will not hurt your credit report, but many defaulted payments can be harmful. A repossession will stay on your report for seven years. Judgments are legal tools which obligate you to make your late reimbursements. This happens when court systems have to force you to pay your debt. A foreclosure is as dangerous as a default on loans. It illustrates a history of late and missed payments. It will certainly send a negative message to the banks. An unpaid judgment is worst than a paid one. Bankruptcy is definitively the most damaging cause for your credit score. Your first bankruptcy will mark your credit report for six or seven years. Filing bankruptcy must absolutely be used as a last resort. All these elements will make any banks and lenders to perceive you as a high credit risk. Even though a bad credit can take time to be restored, there are ways to improve it surely. What steps can you take to improve a bad credit and obtain a loan? Always pay your bills on time and take care of your debts! Utility bills may not be shown on your credit report, but these companies can turn your account into collections. These are agencies hired by a creditor to deal with your missed payments. Additionally, the longer you take to pay your debt, the worse the situation will get. Your credit score can be damaged or your assets can be seized as collateral. If you can afford to pay, contact immediately your bank. They will prefer to negotiate with you a longer-term payment than going through consumer proposal or worse, bankruptcy. Be careful when applying for credit products. It is harmful to apply to many of these products at once. When someone reviews your credit report, soft and hard inquiries will be listed. Soft inquiries happen when someone runs a background check for a job or a rental property and do not affect your credit score. However, hard inquiries happen when a financial company reviews your report. They are damaging because they will stay on your report for three to six years and your score can drop by seven points. Your credit score could be dropped at every credit product application you make. Be reasonable and ask yourself if you really need it. If you have a low credit, you can apply for a secure credit card. These cards are provided for people with bad credit. Secure credit card requires a security deposit equal to the desired limit contrary to any unsecured cards. If the card’s holder does not miss a payment, he or she can apply for a regular unsecured card a few years later then your initial deposit will be refunded. As you improve your credit score, you may need to apply for loans. However, banks may refuse your application if you have a bad credit. But fortunately, for those who are in a financial emergency and in need of a convenient and fast loan solution, there are other alternatives. Private lenders are a good substitute to banks for their easy and fast proceedings. The legibility criteria vary from one company to another. For example: First of all, it has to be paid by direct deposit, you have to be a Canadian citizen, aged 18 years old and above, and have a steady job for at least three months. First and foremost, choose wisely your private lender depending on the amount and the term of the loan. These organizations are mainly for people who are looking for a financial accommodation in the immediate. Contrary to banks, private lenders do not require many documents. You will need to provide a photocopy of your ID, bank statements from two or three months and your last pay stub. The good news for the ones looking for bad credit loans is that private lenders only ask that you have a credit score equal or more than 550. Depending on the private lender you choose, you can either apply online or by phone. You will be asked the amount of money you desire and all the required documents. Applying to bad credit loans can take only a few minutes. Usually, private lenders take less than 24 hours to process your request. There is another great advantage of private lenders. They will come back to you in less than a day. So, if you are in a hurry, they are the perfect solution for you. Once they get back to you, you will have to sign a contract with them. It will mention the details of your reimbursement and the interests. This is crucial as you do not want any more debt. As you can see, a bad credit can lower your chance of receiving a loan. Nonetheless, there are easy ways to improve your credit score and apply for loans. A good tool that can prevent low credit is budgeting. Budgets help you organize your finances and savings for your future.